BROWN BLONDE 6/613 OMBRE BALAYAGE CLIP IN REMY EUROPEAN HUMAN HAIR EXTENSIONS. GUARANTEED THICK AND LONG! Extension colour code: 6/613. The weight is 210-220g worth of luscious hair. 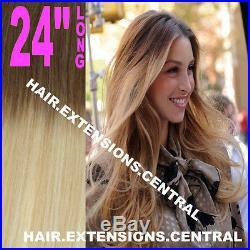 The length of the extension is 24 LONG. Each set contains 7 weft pieces that include. 1x 8 width with 4 clips. 2x 5.5 width with 3 clips. 2x 3 width with 2 clips. 2x 1.5 width with 1 clips. The weft pieces are closely stitched double wefted with small 3cm x1.5cm silicon backed clips for added comfort. Dip dye is 1:1 ratio. TO ORDER YOUR NEW EXTENSIONS. SIMPLY READ AND UNDERSTAND THE. TERMS AND CONDITIONS BELOW. We understand that not all hair extensions are suited for everyone; everyones requirement of thickness differs as everyone has different head shapes etc. We go by the most common extensions that are in salons approved by professional hair stylists in Melbourne. With so many extensions on the market there might be a chance that our extensions may not suit you. The colour chart is used as a guide only, the colour will slightly vary from screen to screen. Gently holding the hair from the top with your hand and gently driving your hand to the bottom of the extensions can determine the thickness. This will also allow you to feel the hair to see if its suited or not and the colour can be visually inspected. Once the hair has been removed from its gold bands and original packaging we are unable to accept a return due to hygienic reasons. Item must not be out of its original packaging and gold bands are to be intact and not removed. Removing the bindings indicates acceptance on your part that the hair is in good condition and suitable for your use. The hair can be dyed or tone; this is to be done at your own risk. We strongly recommend this to be strictly done by a qualified HAIR COLOUR TECHNICIAN generally a senior stylist who has experience to colour hair, check your local directory to find your nearest salon who specialises in colouring, consult with your hair dresser if they are trained. The hair has gone through a strenuous chemical process to get to its colour, a HAIR COLOUR TECHNICIAN will know the balance on how much dye is to be used to get to the colour you require. Some salons do not know the balance to colour the hair and are afraid to waste dye. Test patch is to be done first on a small part of the extension. We are not liable for any damages done by DIY Hair dye kits or untrained salon or hairdresser, apprentices or no experience. We provide free express post. If you would like your hair left unsigned please let us know. We will not be liable for theft or loss. This can cause delays of up to a week. If we do not hear from you we assume you have receieved your hair. Your hair extensions are handcrafted meaning they are not made by machine but in fact handmade, you maybe not be aware but a lot of hours have been spent on your extensions. There maybe a thread or 2 from the weft present or a little cotton from the thread, this can be simply be picked out with your fingers. Shedding of couple of strands is completely normal. You may come across a few strands that maybe black or white or red which is completely unnoticeable. Its a scientific fact that not all human hairs can take colour. If you choose to leave a negative or neutral feedback or threaten, this can prevent you from purchasing from us in the future or purchasing from our sister companies. We have been supplying hair stylists and hair salons with our hair in Melbourne Australia since 2010, with close to wholesale price we have decided to make our extensions available to the general public not just hairdressers. We strive to provide the best quality hair at the best prices. If there is ever any doubt or questions whilst/after purchasing our products. What are Clip In Hair Extensions? Clip-in hair extensions are the number one fashion accessory to own. They are a super quick fix to thin dull, lifeless hair. They are completely indistinguishable and you will receive so many compliments on your hair. Best of all you can clip them in and out whenever and wherever you are within minutes to create luxurious, thick, shiny hair. How long does my hair need to be to wear Clip in Extensions? The shortest you hair should be for best results would be 4-6 inches long. Hair any shorter than this will not be able to hide the clips. How long do they take to put into my hair? They should take roughly 5-10minutes to put in. Like anything, the more you do it the quicker you will get at it. Just think how long it would take you to grow your hair this long?? How long will the hair last? Your extensions are hair accessories and just like any hair accessories, the more its used the lower its life. Your extensions can last up to 24 months when taken proper care of. Hair extensions need to be removed before sleeping and only applied when using for an occasion hence why they are clip ins, if your looking to wear them long term then you will need to look in to more permanent type extensions such as tapes, micro beads and weave in. The hair should be worn about 4-6 times per month then washed, the hair should not be washed with every use but only when there is visible product build up and very important that all hair products are sulphate free. When straightening or curling the hair be sure to use heat protection spray. You can revitalise the hair by using argon oil. The hair should not come in contact with salt water, beach or chlorine as this will dry up the hair, your head provides naturally nutrients to your own hair however not to extensions. How do they attach to my hair? They clip in under your hair by small snap on clips that have been sewn onto the extensions. The clips we use have a silicone insert so they don’t slip or damage your hair. They are less than 1 inch wide and are the same colour as your extensions so they blend in perfectly to your natural hair. The clips don’t pull at your hair and will not ruin your natural hair at all. What type of hair do you use? Will clip in extensions ruin my hair? Extensions which are glued or sewn in can ruin your natural hair. Clip-in extensions won’t ruin your hair at all. Can I wash my hair extensions? Yes you can but not while the clips are attached your head. Remove them first then wash them with shampoo and conditioner just as you would with your natural hair. It is also best to use a deep conditioning treatment such as Moroccan Oil washing your extensions as the extensions don’t get the naturals oils from your hair. Can I cut my extensions? Yes you can but we recommend you get your hairdresser to do this for you. Can I dye my extensions? The hair can be dyed. This is to be done strictly by a professional hair stylist or registered salon. Test on a small part first. Can they be straightened or curled? But as with your natural hair always use heat protect products on your extensions to keep them healthy and shiny and to help them last longer. Can I use products in my hair extensions? Yes you can, any products that are suitable for your head will be fine with your extensions. The item “24 THICK BALAYAGE OMBRE CLIP IN REMY HUMAN HAIR EXTENSIONS BROWN BLONDE 6/613″ is in sale since Thursday, July 24, 2014. This item is in the category “Health & Beauty\Hair Care & Styling\Hair Extensions & Wigs\Hair Extensions”. The seller is “hair.extensions.express” and is located in Melbourne. This item can be shipped worldwide.